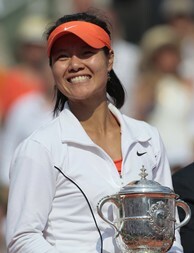 China's Li Na became the first-ever Chinese Grand Slam champion by winning the 2011 French Open. PARIS (AP) - Li Na ended China's long wait for a Grand Slam champion Saturday, defeating Francesca Schiavone 6-4, 7-6 (0) in the French Open final. The Australian Open runner-up celebrated by falling flat on her back in the red clay after Schiavone hit a backhand long on match point. The crowd at Roland Garros was dotted with red Chinese flags and a small vocal group supporting Schiavone. They watched as Li dropped her serve for the only time late in the second set. On Sunday, five-time champion Rafael Nadal will face Roger Federer in the men's final. The title was only the fifth in Li's career, and her first on clay. But it is the biggest victory on a tennis court for China, which has already started savoring the moment. Li, however, won't return home to relish in her achievement until after Wimbledon. "If I (don't) do well in Wimbledon, maybe people forget me already,'' said Li, with a smile. She was broken only once by the defending champion, while converting two of her eight break points - one in each set. She finished with 31 winners to 12 for Schiavone. Li took a 3-2 lead in the first set when Schiavone sent a forehand wide. She held at love in the next two games, and then won the set when Schiavone sent a forehand long. The Chinese player opened the second set with her second break of the match, and then saved Schiavone's first break point in the next game with an ace. But Schiavone broke back in the eighth game to even the score 4-4. Both players held the rest of the way, but Schiavone came within two points of winning the set on five occasions, three times at 5-4 and twice more at 6-5. The point that first put Schiavone that close was a bit awkward. Schiavone sent a backhand return straight at Li, but the ball skidded off the white baseline and under Li's racket, causing her to take a big swing and miss. Schiavone raised her hand to apologize, and then lost the next point when she stretched for a forehand and sent it wide. In the 12th game, Schiavone contested a line call, arguing a shot by Li was out. The chair umpire ran across the court to investigate and ruled that the ball touched the line. "That ball was out,'' said Schiavone, who put a backhand into the net on the next point and then lost all seven points in the tiebreaker. Although Li has said she is not a big fan of playing on clay, her power and precision worked well against Schiavone, who last year became the first Italian woman to win a Grand Slam singles title. For Li, the year started well but soon took a dip. After losing to Kim Clijsters in the Australian Open final, the 29-year-old Li lost her next four matches. But she recovered her form shortly before the French Open, reaching the semifinals in Madrid. By winning Saturday, Li is expected to move to No. 4 in the rankings, matching the record for the highest ranking by a woman from Asia achieved by Kimiko Date-Krumm of Japan. Both Li and Schiavone came into the final with plenty of experience. Combined, they were the oldest pair in a women's Grand Slam final since Wimbledon in 1998, when Jana Novotna, 29, beat Nathalie Tauziat, 30.